Here I come with new Guitar Article in this Post we learn how using a Pick with Acoustic Guitar. 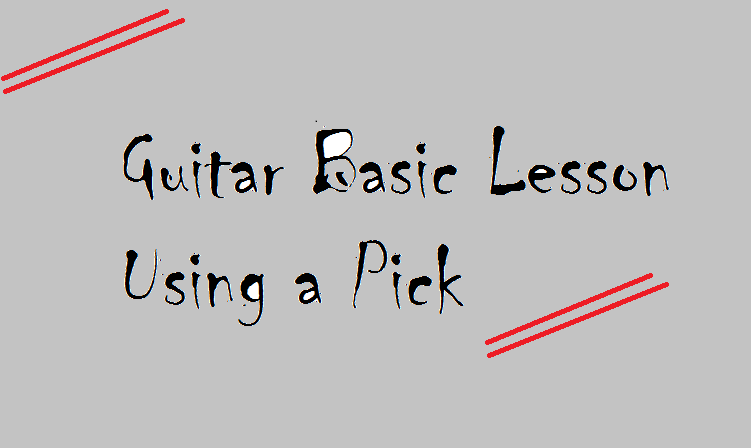 One question many people have when they begin learning the guitar is “What kind of pick should I use?” The answer is simple. Use whatever feels comfortable for you. Some people use thick picks. Some use thin. Each kind of pick has a different sound to it, so experiment with different ones. When you decide what kind of pick to use, try holding it between your thumb and your index finger or your thumb and middle finger. Remember, do what feels comfortable for you. Take a look at the picture below. This will give you a reference on how to hold the pick. Some people don’t even use a pick. I myself just use my fingers a lot of the time, although I do use a pick for certain things. I believe you should learn to use both. There are certain things that will sound better with a pick, and certain things that will sound better using your fingers. To find out what feels the most comfortable, experiment with different picks and using only your fingers. In this book, we will concentrate on using the pick. In my opinion, it is necessary to learn how to play with a pick in order to achieve the many sounds capable on the guitar.